As promised, black bread. 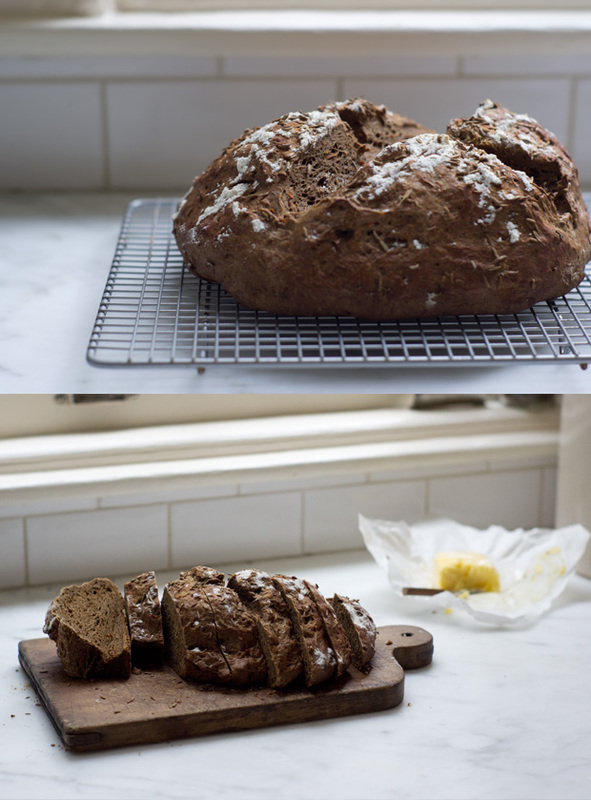 It's what I crave when I think of winter-time baking, and I've been making consecutive loaves over the past few weeks. Caraway-crusted, flecked with dashes of grated carrot, it's dark and hearty, and perfect when toasted then topped with a fat smear of dill butter. This is a hodgepodge of a recipe that isn't shy with the rye flour, and stems from a version of black bread in Dan Lepard's Short & Sweet. I use Dan's ingredient list and the method of bread-making I learned as a kid. Pretty much - mix, rise, punch, rise, bake. What you end up with here is a rustic, elbows-on-the-table style of crusted loaf with an assertive caraway-molasses streak. Once it's out of the oven, use your best butter to top it. Or, let a slab of it sit under a broiler topped with your favorite melty cheese - either gruyere or goat cheese does the trick. Beyond that, allow me to tell you what I've made of it. For lunch: An open-faced sandwich on toasted Black Bread, with the dill butter from SNED, a bit of sauteed kale, and a fried egg. Remains of a two-day-old loaf? Cubed, tossed in a bit of garlic butter and toasted into croutons. And dare I tell you that this bread was made for fondue? Because it was. This recipe calls for carrots, which add nice flecks of color, but you can do a potato version as well. Also, I use molasses here, but a lot of you (particularly outside the U.S.) tend to ask me for alternatives - black treacle, or honey will also work. Honey will give you a lighter bread though. For those of you skittish about yeast doughs, I tend to let my dough rise on top of my stove when then oven is on, but a sunny spot usually works nicely too. In a small bowl whisk the yeast with 1 1/3 cups / 320 ml of the warm water and sugar, and set aside until foamy. If the yeast doesn't activate, try again. Combine the yeast mixture with the grated carrot and molasses mixture in a large mixing bowl. Add the flours, and stir until you've got a soft, tacky, cohesive dough. If you'r dough is too dry, add more of the warm water a bit at a time. Alternately, if your dough is a bit too wet, and you need to add a bit more flour, do so. Turn the dough out onto your counter and knead for about 5 minutes, or until the dough is elastic and springy. Note: you can do this step using the dough hook on your mixer. Shape the dough into a ball, rub with a bit of olive oil, and place seam-side down into an oiled bowl. Cover and allow to rise in a warm, cozy place for 1- 2 hours or until the dough increases in size by at least half. At this point, gently press down, with a closed fist, across the surface of the dough. Turn the dough out onto a lightly floured counter, and coerce into a pleasant-shaped round. Place directly on a very lightly oiled baking sheet, then cover loosely with a floured tea cloth or plastic wrap. Allow to rise in a warm place until nearly doubled in size, another hour. Uncover, brush gently with buttermilk, sprinkle with a dusting of flour, ~1 teaspoon caraway seeds, and use a serrated knife to slash an 'X' deeply across the dough (do your best not to deflate the loaf). Bake for 20 minutes at 425F / 220C. Dial back the heat to 350F / 180C, and bake for another 20-25 minutes, or until the loaf develops a structured, toasted-bottomed crust, and the loaf sounds a bit hollow when you knock on it. Remove from oven and let cool for at least 15 minutes on a rack before slicing into.